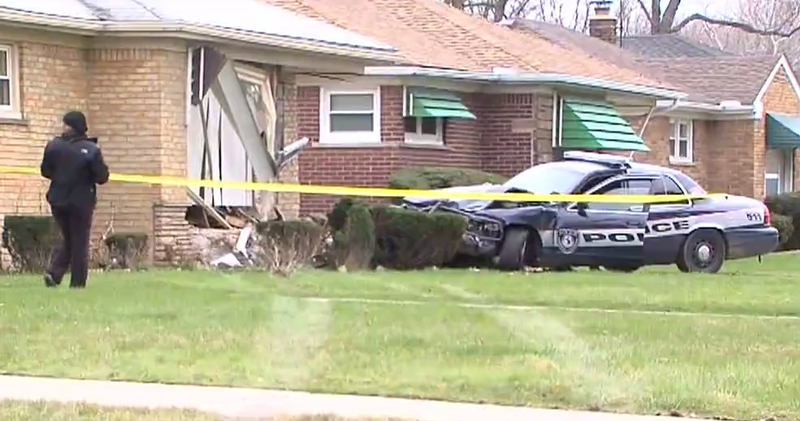 A local law enforcement officer crashed a police cruiser into a home in Harper Woods, Michigan, destroying the home’s front porch and bay window and totalling the vehicle, according to multiple local news reports. Police said that the officer had responded to a call and was on his way back to the precinct when he suffered from some kind medical emergency, both the CBS and ABC affiliates in Detroit reported. It remains unclear as to the nature of the medical emergency. Earlier, Harper Woods Police Chief Jim Burke said that the department was not sure what had happened, but that the officer now appears to be okay after being treated for injuries sustained in the accident. We don’t know if it was a medical issue or what happened. He has no memory of what happened. He’s alert, conscious, surprisingly in good shape. Nothing major doctors have, but they will hold him overnight. Neither the homeowner nor members of her family were present for the crash, and no one other than the officer involved was hurt.